Cucumber Salad with Peanut Sauce is an easy make ahead dish to keep in the refrigerator and assemble quickly for fresh, fast meals. It doesn’t take a lot of time to get creative in the kitchen. One recipe = endless combinations for your next make ahead appetizer, salad or main dish. 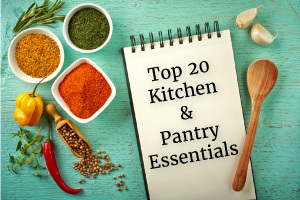 Assemble ingredients: Soy sauce, peanut or any nut butter, hot sauce, cayenne, ginger, any kind of nut, lime juice, mint and cucumbers. Not pictured: honey or a dash of your favorite sweetener. Use the tines of your fork to scrape lines down the sides of an English cucumber all the way around to create a pretty edge. You could also use 2 regular cucumbers, peeled to create stripes or unpeeled. 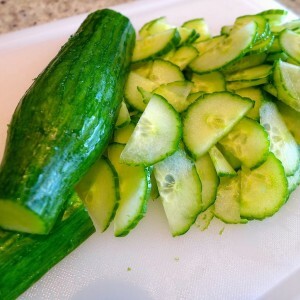 Cut the cucumbers in half, lengthwise, then slice thinly. Cucumber slices will last, covered in the fridge, for about 5 days. This salad makes 6-8 servings, so you can reserve some of the cucumbers and sauce in the fridge to make multiple meals. Vegetable tray idea: slice cucumbers into sticks the size of baby carrots. Make a plate of cucumber sticks and other raw vegetables like bell peppers and carrots and serve with the peanut sauce as a dip. Add a little extra peanut butter to the sauce to make the dip thicker. Line your measuring cup with plastic wrap before measuring 1/4 cup peanut butter for easy clean up. If you don’t like spicy, skip the hot sauce and cayenne. Peel and grate fresh ginger with a zester or substitute 1/2 teaspoon dry ground ginger powder. After mixing your sauce, taste it and add a teaspoon or two of honey or sugar substitute if you like. 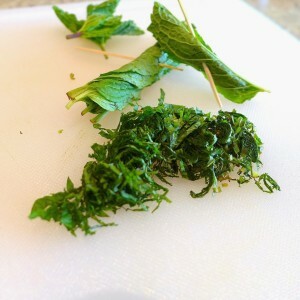 Stack 10 -12 mint leaves together at a time, roll up tightly and thinly slice into ribbons. Save a few smaller whole leaves for garnish. 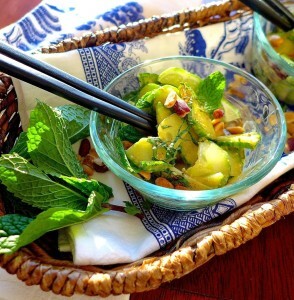 Toss cucumbers with the peanut sauce, add peanuts and mint ribbons and serve. See variations below for magical combinations and new meal planning ideas! Cucumbers are just the starting point for this versatile salad! 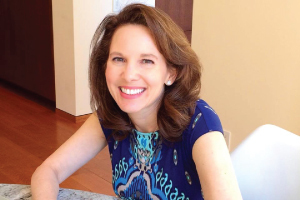 See variations to create new combinations all year long! Serves 6 – 8 as a side, 4 as a main dish (just add a protein). 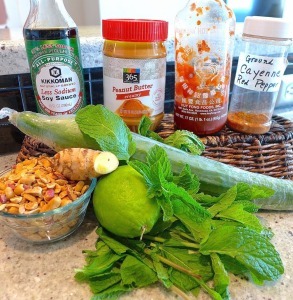 Make the sauce: In a small bowl, whisk together soy sauce, lime juice, peanut butter and sriracha sauce. Add ginger, honey and cayenne and stir to blend. If too thick, thin with a little cold water. If you like a thicker sauce, add more peanut or nut butter. Taste sauce and adjust to your liking. To prepare in advance, chop cucumbers, make the sauce and store ingredients separately in the fridge for up to five days. Just before serving, place drained cucumbers in a serving or mixing bowl and toss with sauce. Add half of the peanuts and half the mint and toss again. 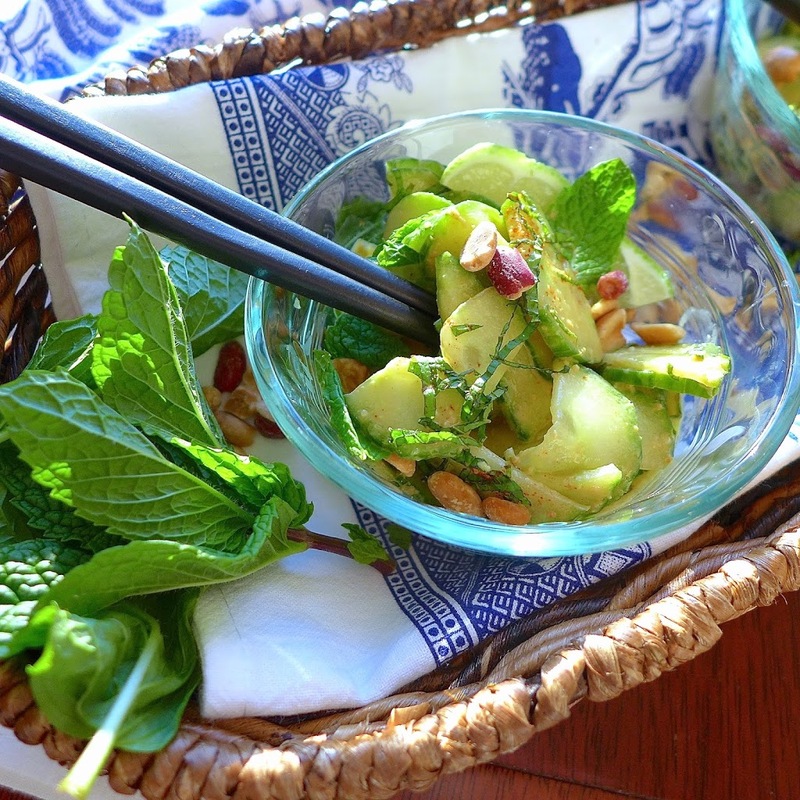 Garnish with remaining nuts, mint ribbons, mint leaves and lime slices. Vegetables: Add or substitute shredded cabbage, carrots, beets or jicama. Herbs: Substitute cilantro or parsley for mint. Fruits: Add grated apple, mandarin oranges, raisins or dried chopped fruit. Nut butters: Substitute almond or sunflower butter or nut butter of choice. Oil: Replace peanut butter with 2 tablespoons light olive or vegetable oil. Nuts: Substitute chopped roasted pistachios, almonds, cashews or sesame seeds. Protein: Add your choice of cooked chicken, pork, beef, fish, seafood, tofu or vegetarian protein. Grains/Seeds: Add a cooked grain (or grain substitute) like soba noodles, rice noodles, quinoa, wild rice or grain of choice.